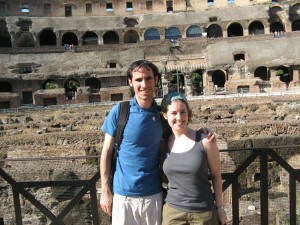 Bloom, a native Australian, and Ilana, a mid-western American, met in Israel in 2006 where they were both living, and loitering excessively in the shuk, specifically at the (now defunct) Indian restaurant. They started dating in 2007, and later that year Bloom moved with Ilana to NY after she took a teaching job there. Bloom agreed to move to NY with the stipulation that after three years in NY, they would take at least one year to travel the world. Bloom believes that people should never own more than they can fit in one backpack (not including books). Ilana has trouble fitting all of her stuff in their one bedroom Manhattan apartment. To her credit, Manhattan apartments are really small! Bloom does not believe in planning too much, while Ilana has been reading travel blogs and forums for the past 3 years in preparation for this trip. They both love Indian food and watching Family Guy and Seinfeld reruns. They are both observant Jews, keeping kosher and observing Shabbat. This will definitely be an interesting trip.